The Delta map turtle is one of the "sawbacked" types. At the time I decided I wished to photograph the Delta map turtle in the wild, it was considered a named subspecies, Graptemys nigrinoda delticola, the darker and easternmore of the 2 forms of the. black-knobbed map turtle. Even back then, the subspecific differences, hence validity, had been questioned. And with the 2 races interbreeding widely and seeminly at every given opportunity, the differentiating features between the western and the eastern races were fast melding. It was becoming ever more difficult to separate them by appearance alone. But it still seemed that the map turtles at the eastern most periphery of the species range north of Mobile Bay were darker overall, often had linear postorbital markings, and had larger dark plastral figures than examples from further west. So, when, a couple of springs ago, I still wanted to see this turtle, Curtis suggested a “can’t miss” locale and Kenny and I, in the region for other reasons, headed northward from Mobile Bay. Within 10 miles the sky darkened, the sun was obscured, immense cumulus clouds gathered and we drove into storms so intense that traffic was almost at a standstill. Still we crawled northward, eventually left the rain (but not the clouds) behind. An hour and a half later, in late afternoon, when we arrived at the map turtle destination it was still so dark that the cameras had problems focusing on the few Delta maps that were still hoping for sunlight on exposed snags. Although we decided to remain overnight and try our luck the next morning, cloudy conditions continued to prevail. The few pix we managed to take were suitable for vouchers but marginal (as you can see here) for more definitive purposes. Next time though—next time! Continue reading "The Search for the Delta Map Turtle"
Fallout from two highly publicized cobra escapes in Florida is leading to changes in Florida venomous snake regulations in 2016. According to a memo released by the Florida Fish & Wildlife Commission (see above), the state is banning the use of melamine/particle board enclosures due to their tendency to be warped or damaged by moisture. Venomous Permit holders in Florida have until February 28th, 2016 to bring their caging into compliance. Also, the Florida is moving ahead with the revision of it's venomous regulations, a process begun last year, before the escapes, with a series of public meetings that began in December of 2014. Based on the input from those 8 meetings, FWC staff is reviewing the recommendations and is preparing draft rules and options for stakeholder input. The entire head of some red-cheeked mud turtles is suffused with red. Whether you consider the red-cheek a full species (Kinosternon cruentatum) or a subspecies of the scorpion mud turtle (K. scorpioides cruentatum), there can be little argument that some examples are one of, if not the, prettiest of the genus. Long (and with good reason) a hobbyist favorite, the amount of red on the face of this 4 to 6 inch long aquatic turtle, can vary from little more than a facial smudge (and even this may dull with advancing age) to a long-lasting brilliant suffusion encompassing the entire head. This small and easily kept turtle is native to the Yucatan Peninsula region (southeastern Mexico and Belize). Wild collected adult examples are still occasionally available and a fair number of hatchlings are produced in captivity. Although these (and other kinosternids) can be kept in aquaria with shallow clean water, and although they seldom bask even when it is easy for them to do so, I do offer a shelf (or smooth flat rock, where they can rest an inch or two below the water’s surface. The turtles usually thrive on a diet of high quality pelleted food but will appreciate a periodic offering of a nightcrawler or a freshly killed minnow. Hardy and easily kept, be prepared to have your red-cheeks for decades. Continue reading "Red-cheeked Mud Turtle"
Although not common, red phase brown anoles are well documented in Florida populations. This pretty little female brown anole visited our back deck yesterday. She caught the eye of an amorous male brown anole of normal color. As far as aberrancies go, orange headed female and all orange male brown anoles are not particularly rare. And each time I see one I am reminded of the first one I ever saw. An adult male, it was in a terrarium at a reptile dealership and had just been sold to a well-known herpetoculturist for the whopping sum of several hundred dollars. Since then I have seen a dozen or so males and about 3 times that many orange-headed females in the wild. 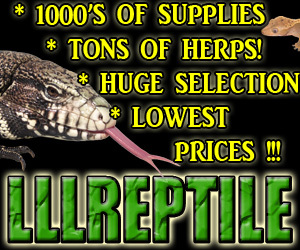 But I was recently told that a vendor at an east coast herp expo had a number of orange phase brown anoles that he was offering at exorbitant prices. Build it and they will come. Offer it and they will buy. And then there was P.T.Barnum’s supposed statement, but I won’t go there! Continue reading "A Red (orange, really)-headed Brown Anole"
Photographing herps is an art form that takes many years to master. Even after many years of practice I can always find something wrong with the best pictures I have taken and, like all of you, I wish I could take better herp pictures. But I am still practicing and learning, and getting a little better each time. A lot of photographers think you need to have the best this, or latest that, to capture that epic picture. I have a different approach than many herp photographers I see out there. No matter how nice your camera is, someone else has a better one. But it's not the camera that makes the photograph, it's just a tool. Even the cheapest digital cameras can take a killer picture if you learn how to use it properly and learn to work within its limitations. So my first two points for now are that even a cheap camera can capture a killer picture if you take time to learn how to use it, AND if you have the most expensive camera out there you will still find something wrong with the pictures you take and will be plagued with the desire to improve. I will discuss herp photography more in future blogs, but in the meantime enjoy this shot I took of a Green Tree Frog, Hyla cinerea. And as you can see, even with this photo there is a lot of room for improvement, and it is important that you always see things that way when you review your own pictures! A common liana snake en situ, Peruvian Amazon. We had looked for years with no success for a common liana snake, Siphlophis cervinus, on the Amazonian (Peru) preserves that Patti and I regularly visited. We looked high and low, in trailside trees, in shrubs, and of course on lianas but to no avail. After all, this was known to be an arboreal, nocturnal, species so we scoured and rescoured leafed branches, bare branches. bromeliad cups, you name it. If it saw above ground level and reachable by us, we looked. So where did we find our first liana snake? It was crawling busily along atop fallen wet leaves in mid-trail a fair distance from any arboreal highways on Madre Selva Biological Preserve. About 20” long the slender snake was even prettier than it pix had led us to believe. Its busy pattern, a mosaic of yellow shades on black, orange highlights on black, and black reticulations on and orange vertebral line, was nothing short of spectacular. But this first found terrestrial example has proven to be the exception. Although we still don’t consider this species common, since the first find we have averaged one Liana snake per trip. On one trip we were lucky enough to find 2. But when compared to the dozens of calico snakes and rainbow boas we have happened across, the common liana snake has still proven far from a common find. Continue reading "Lots of Lianas but just a few Liana Snakes"